Patriarch John of Antioch and All East was one of the first primates who definitely backed up the Russian Orthodox Church in the Ukrainian question. More than once he urged Patriarch Bartholomew to consider the opinion of all local Churches before taking a responsible decision. 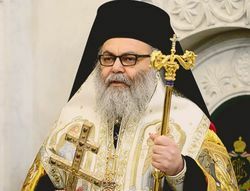 The head of the Antiochian Church told Interfax-Religion correspondent Elena Verevkina about his attitude to the Constantinople Patriarchate, supremacy of its primate, which depends on the degree of his responsibility, and the lentil soup. - Do you think that claims of Patriarch Bartholomew for the right of the final vote in the Orthodox world are justified? Don’t you think that even the naming ‘Ecumenical Patriarchate’ contradicts the Orthodox church rules? - All these names were given to Churches historically in process of their development. We call Patriarch Bartholomew the Patriarch of Constantinople, and all Churches accept it, even the Russian Orthodox Church. He is the first among patriarchs and certainly he bears more responsibility than others that’s why we call him the Ecumenical Patriarch. We wish his era, his time becomes the time of peace and unity of the Orthodox world. In 1961, on Rhodes we started preparing for an Orthodox Ecumenical Council. Seventy years passed since that time and we are still preparing for it. And this responsibility lays on the Ecumenical Patriarch. We should always be together with each other. And we should be with Patriarch Bartholomew in things that are good for the Orthodox Church. - You’ve urged to settle the Ukrainian crisis considering the opinion of all Orthodox Churches. What form do you consider possible for such a dialogue? We know that attempt to gather Orthodox council in Crete failed. Do you think that Orthodox Churches today are ready for joint discussions? - We are working over it, we are walking along this way. On behalf of the Church of Antioch we wrote to Patriarch Bartholomew and talked to him several times, asking him to invite representatives of local Churches. We have not got an answer yet. However, we have honest and open relations with heads of Orthodox Churches and it is a pledge of successful dialogue, I consider a meeting possible. All problems can be settled through dialogue and meetings. - What do you think about Orthodox unity? Does it exist today and how is it manifested? - Orthodox Churches are united Churches, no one can split them. All Churches believe that they constitute one Church. We represent the Antiochian Church, but here in Moscow we feel that we are one family with you, believers of the one Church. It is very important, despite of all discords. Discords have always existed in church history, as there are disputes among brothers in every family, but we remain the same family. We are working to ease and overcome these hardships. - The monastery in Maaloula is almost restored. Does the monastery accept pilgrims who want to spend some time in the monastery and work there? - Welcome to the Church of Antioch! St. Thecla Monastery welcomes everyone, doors pf the monastery are open for all people. Traditionally all pilgrims from Lebanon and other countries visit the Sinai Monastery and then go to the Maaloula Monastery. Nuns have already returned to the monastery, the restoration works are almost completed. Many families have also returned to Maaloula. Normal life was restored in the town and doors of the monastery are open to every pilgrim. Several years ago we were going through hardships, many churches were destroyed. Again and again I remind that two metropolitans of Aleppo - John and Paul - were seized. We know nothing about them. It’s a shame to keep silence about it! We speak about human rights, while the destiny of two our brothers remain unknown. Thanks to the Lord, seized nuns were returned. Today they are ready to welcome pilgrims. Many of Russian delegations that visit Damascus, then go to Maaloula. Police units work in town, special security service is not needed in the monastery today. - Please, tell us a few words about traditions of fast in the Church of Antioch. Russian believers usually eat porridge during the Lent, and what do your believers eat when fasting? - We eat vegetables when we fast. Orthodox Church is one Church, I know that you also eat vegetables. We like lentil soup, it is our traditional dish for the fast. - Are there some traditions in the Antiochian Church, which differ dramatically from Russian church traditions? - Every Church has its own local traditions. Picture's worth a thousand words, come and see! - How do you like Russia? Isn’t it too cold? - The heat of your love embraced us. It is impossible to be frozen with such a temperature in your heart.